UPDATED: April 15, 2015: BIR provided answers to more technical issues, as well as provided detailed processes and instructions. Filing of all tax returns is now electronic, according to the Bureau of Internal Revenue (BIR). Under the new regulation issued last September 5, 2014, the use of Electronic BIR Forms (eBIRForms) in filing all tax returns (see list below) is mandatory starting October 1, 2014, for all tax returns for September 2014. Before, the filing of tax returns was done via Manual Forms from the BIR office or downloadable either in pdf or excel fillable forms for those non-EFPS (Electronic and Filing Payment System) filers. The mandatory filing using eBIRForms was developed by BIR to provide taxpayers with an accessible and more convenient filing procedure. At the same time, this will also ensure that filed tax returns in BIR will be more efficient and accurate. 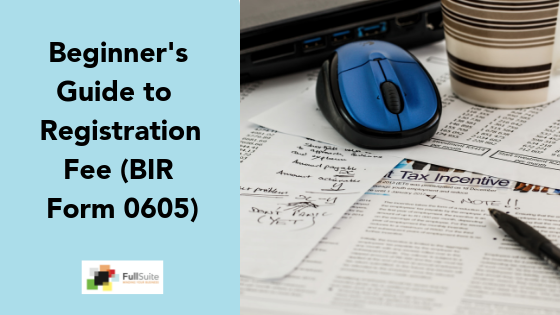 What are Electronic BIR Forms (eBIRForms)? A tax preparation software allows the taxpayer and Accredited Tax Agent (ATA) to fill up tax forms offline. 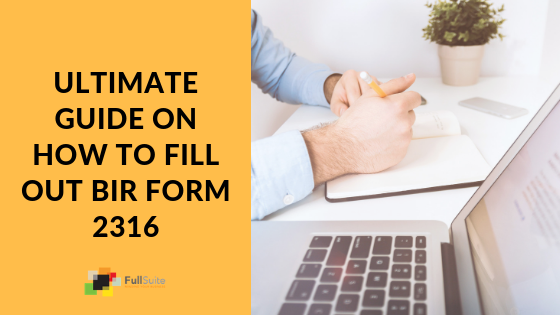 Unlike filling up pre-printed forms by hand, this allows the user to directly encode data, validate, edit, save, delete, view and print the tax returns. It performs automatic computations and can also validate any information inputted. A filing system where the taxpayer and ATA can submit their tax returns online. It automatically computes penalties for tax returns submitted beyond the due date. It is capable of accepting returns data filed using certified Tax Software Providers’ (TSP) tax preparation software. Do I Need Internet to File eBIRForms? The eBIRForms are available to all filers with or without internet access. Taxpayers with Internet can download the eBIRForms Package from the BIR website. Step 5: The eFPS or eBIRForms online enrollment form appears. Complete the required fields on the Enrollment Form page. Then, click on the “Submit” button. I Can’t Access the BIR Website for the eBIRforms. What are the Alternative Methods? Taxpayers without internet can download the eBIRForms Package from the BIR e-lounges. They can copy the files through USB flash drives from the RDO e-Lounge. Filers can submit tax returns manually using the eBIRForms Offline Package at their respective Revenue District Office (RDO) or electronically through the use of the Online eBIRForms System. 1. Uninstall eBIRForms Package version 4.7.07 or below. 2. Download the Offline eBIRForms Package version 4.7.08 from any of the above links. 4. Open the eBIRForms icon to use the Offline eBIRForms Package version 4.7.08. Click here for the full list of BIR Form Nos covered by eBIRForms. • eBIRForms Package is best viewed in 1152 x 864 screen resolution. After downloading the package, it should be noted that the taxpayer must exit the BIR website, to avoid site traffic congestion. Returns can be prepared offline after installation. A copy of the return can then be saved by clicking the button Final Copy, and then click Submit. You must be online when clicking Submit. 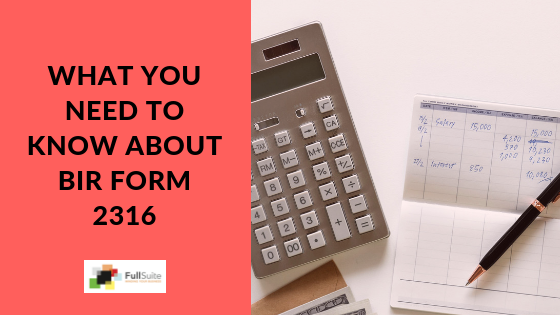 You will then be redirected to eFile using the Online eBIRForms System, a filing infrastructure that accepts tax returns submitted online and automatically computes penalties for tax returns submitted beyond the due date. After submitting the returns online, the system will prompt and ask if you are already enrolled in the Online eBIRForms System. If you already are, you will be asked to provide your username and password. If not, you will be asked to enroll, and you be redirected to the enrollment site. To enroll, click on the “SIGN UP” tab. Previously encoded Annual ITRs using eBIRForms Package version 4.7.07 can still be used in Offline eBIRForms Package version 4.7.08. If “Final Copy” was not yet executed in Offline eBIRForms Package version 4.7.07, it can be submitted using Offline eBIRForms Package version 4.7.08. If “Final Copy” was already executed or there is no email notification received after 2 hours from eFiling, or a message appeared saying that your ITL is not successfully eFiled, then follow the process in Annex D of RMC No. 14-2015.
Who Are Covered by the Regulation? Not all taxpayers are required to file electronically. Only taxpayers enumerated above are required/mandated to file electronically. Other taxpayers such as Micro Small Medium Enterprises (MSME) who are filing their own returns and have tax payment due are not required to file electronically. However, nothing prevents them to voluntarily enrol and file using either the eFPS/eBIRForms electronic platform of the BIR. The existing procedures on MANUAL FILING shall still apply. • Employees qualified for substituted filing under RR 2-98 Sec. 2.83.4, as amended, but opted to file for an Income Tax Return (ITR) and are filing for purposes of promotion (PNP/AFP), loans, scholarship, foreign travel requirements, etc. Which BIR Forms are Covered by the Regulation? Use eFPS. However, for forms not available in eFPS, use eBIRForms. In which case, enrollment to eBIRForms is required. What Does this Mean if I Have a Business? For entrepreneurs, this includes filing of taxes for the no payment transactions (see item number 4 under “Who are Covered by the Regulation?”, that you are filing for “no payment” or “no transaction” or “NIL” for that tax return type. How Do I File eBIRForms? 1. Download the software package at bir.gov.ph (Go to Eservices > EBIR Forms > Package; choose version 4.7.08). It will generate the desired tax return form for you. Simply input all pertinent information as a taxpayer, your TIN, Business Name, Registered Address, RDO and Name. 2. Print and sign the generated tax return and file it manually/physically at your respective BIR (RDO). Please note that in the system generated return, the selection boxes from Manual Form were replaced by radio buttons. Below the page, you will see the tracking path where the BIR Form was generated and the actual date it was printed. Nonetheless, the actual return hasn’t changed its identity. * Taxpayers using the offline eBIRforms version 4.7.07 can easily submit the 2014 ITR via email, and subsequently, enroll after eFiling. Thus, email submission of 2014 ITR is allowed whether enrolled or not to eBIRForms System. How to I e-file a Return? 2. After downloading the Package, log off the website. 3. Install the Package and then open it. 5. Validate after completely encoding all necessary information. You may still update/modify by clicking EDIT if needed, and Indicate correct entries. Then click “Validate” again. 7. Go online and submit the accomplished tax return to eFPS or online eBIRForms. A Filing Reference Number (FRN) shall be generated in all returns as acknowledgment of its receipt. However, for Income Tax Returns filed for Calendar Year 2014, acknowledgment in the form of email notification for BIR Form Nos. 1700, 1701, 1702RT, 1702EX and 1702MX shall be received by the taxpayer as evidence of eFiled ITR in the eBIRForms. Do I Still Need to Submit the Printed Form After EFiling to the RDO or AAB? How About Attachment? If you electronically file and electronically pay using eBIRForms or eFPS without any attachments required, you don’t need to submit anything to the RDO/LTDO/LT Office. However, if there are required attachments in your income tax returns, you shall submit to the RDO/LTDO/LT Office within fifteen (15) days from the date of eFiling. 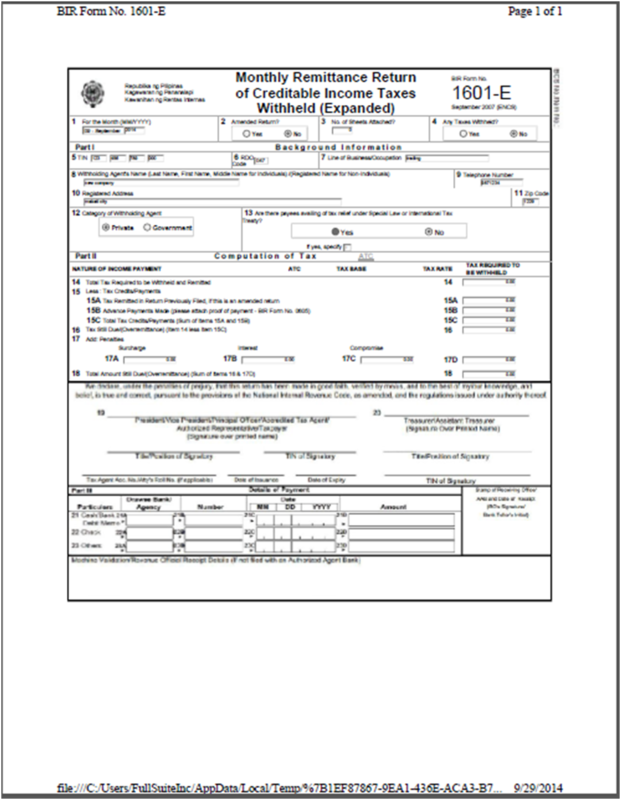 Users can also view their submitted forms by clicking on the “Submitted Tax Returns” link. Yes, it’s still possible to modify, correct and edit entries. The use of Offline eBIRForms is encouraged used to provide ample time for return preparation and does not require an internet connection. Make sure that you to click validate every time you make any changes, edits, or modifications. Once the FINAL COPY is clicked, subsequent changes to the forms will no longer be allowed. This creates the final copy for submission to the BIR. It creates an encrypted copy with an xml file extension. For taxpayers enrolled with eBIRForms, type your username and password for the return to be eFiled and an email Notification will be generated as proof that the return has been received by the BIR. You can then proceed to ePay (upon availability) or manually pay following existing issuances. After completing the returns in Offline eBIRForms and clicking “FINAL COPY”, the system will ask if you are filing online. If “YES”, then the return will be eFiled and an email notification will be generated as proof that the return has been received by the BIR. Proceed to manually pay following existing issuances and procedures. Subsequently, when asked to enroll to eBIRForms, if “YES”, the system redirects to the eBIRForms enrollment process. After clicking the “FINAL COPY”, the system will pop-up a message that the data was successfully sent to BIR. An email will likewise be sent to taxpayer’s inbox and there’s a need to print and save the email notification as an evidence of eFiled return. Click “OK”, will require to click “PRINT” for each page of the return as evidence of eFiled return. Print three (3) copies or as many as needed for future use. Ensure that the printed returns from electronic platforms are similar to the official printed form issued by the BIR without any resizing, shrinking, or enlarging. • The email address indicated/encoded in the return is VALID and ACTIVE. The mailbox has enough space/not “quota exceeded”. • BIR email is not in the SPAM folder. • BIR website “bir.gov.ph” is NOT BLOCKED by your email provider. Non-compliance in any of the above requires re-encoding and re-submission of the return. If, after MANUALLY emailing following the steps in Annex D of RMC 14-2015, no email is received after two (2) hours, then call the BIR for assistance. In the email Notification Received from BIR Using eBIRForms, There Is an Attached File (xml) of the efiled Return. Can I Open the Attached File for My Printing and Use? The final copy of the returns automatically saved in the computer and can be retrieved/opened thru the eBIRForms where the list of BIR Forms are shown, then select the form number and the list of filed returns will be displayed on the summary table with the corresponding return periods. Click the specific return to be retrieved then click “view”. 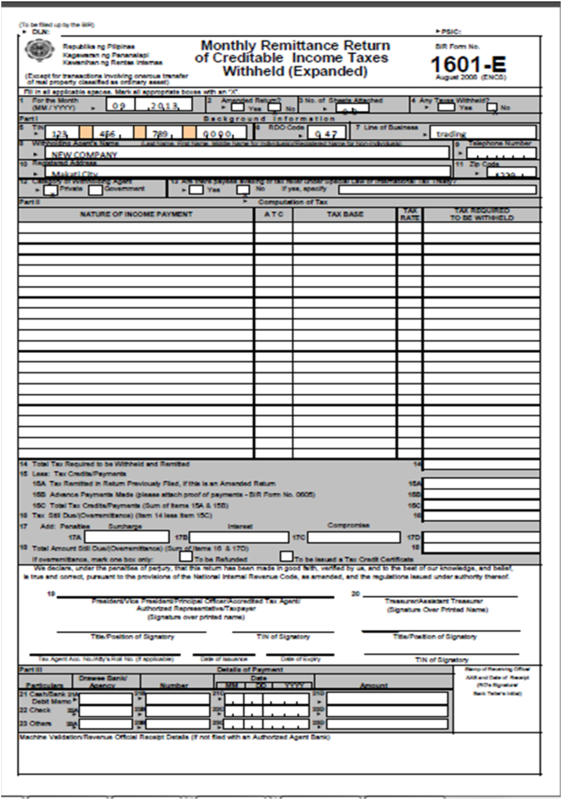 Yes, simply click on the “Submitted Tax Return” button and select the required return to view and print. It all depends on the browser of the computer being used. eBIRForms System is compatible with Internet Explorer 9. Enter 3 numeric on the 1St box, then the 7 digit number in the 2nd box. For browser Internet Explorer 10 or higher, use Google Chrome Browser v23 or up and Mozilla FireFox v16 or up in enrolment. Why Do I Receive an Error Saying My TIN Is Invalid During Enrollment in the eBIRForms? How Can I Print the Form? Do not resize/shrink to fit/enlarge or custom scale when printing. Page scaling should be set to ”NONE” or ACTUAL SIZE. Returns from electronic platform should be similar to the Official printed form issued by the BIR. In addition, the taxpayer shall also be imposed with civil penalties equivalent to 25% of the tax due to be paid, for filings a return not in accordance with existing regulations, thus, tantamount to WRONG VENUE filing pursuant to Section 248 (A)(3) of the NIRC of 1997 as amended. The term “Client-Taxpayers” means those taxpayers who are otherwise authorizing their tax agents/practitioners to file on their behalf. Therefore, client-taxpayers whose tax agents/practitioners only sign the audit certificate but have NO AUTHORITY TO FILE THE RETURNS IN THEIR BEHALF are NOT COVERED by the said revenue issuance. For the purpose of determining the date when the returns are filed, if no payment is required, it shall be the date the original eFiling was duly submitted. Hence, it is necessary that the FRN and/or email notification must always be kept as evidence of efiling. However, if payment is required, it is the date of the payment that determines whether the returns were filed on time and whether or not surcharges, penalties and/or interest shall be due. Yes, all taxpayers enrolled in either eFPS or eBIRForms or those who will file manually, are encouraged to use Offline eBIRForms for ease and convenience, and to provide them ample time to encode/edit and complete their returns. Upon completion of the return and when ready to submit, to either eFPS or online eBIRForms. This will provide a better opportunity for all to connect to BIR faster and with ease. Only then, the taxpayer will be redirected to the login page to type username and password. For eFPS, eFile and FRN shall be generated by the system, then you can continue to ePay. Do you provide any training on how to use this online system tp fill out BIR forma for taxes? It will be great to attend one so I can start using this system. I have about 5 properties I rent out. I normally go to the BIR office to have form 1701Q printed. And due to the time constraints with when 1701Q needs to be paid, I have to travel again the next day to make payment. So this form alone takes me 2 days. Maybe knowing how to use this online system will help me save time. Be great if you have a training program for this in Cebu City so that I can attend. Thanks. Can I file my 2551M online if it’s No Income or do I have to physically go to BIR to have it received? Please enlighten me. Haha! With regards to BIR 1700, after filing and payment I noticed that I wrongly encoded the wrong employer name ? How will I amend it? And is there any penalty on the amendment of employer name? How can I change my Tax Type Code.? Instead of putting XM020 and WE, I mistakenly selected MC200 and MC. I already complete the filing and payment, but with the wrong Tax Type Code. Didn’t notice the error until I printed a copy of the Final Payment Form with the reference number at the top corner. Really need help on this!!! You may amend this by filling up a new form with the proper tax code. Make sure that you indicate the amount you already paid in the “amount paid if this is an amended return” field, so you won’t have to pay again.